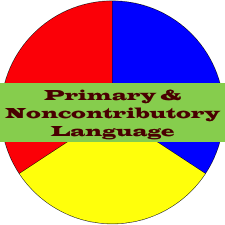 In prior articles, I reinforced the importance of general contractors including “primary and noncontributory” language in subcontracts and requiring the subcontractor to provide an analogous “primary and noncontributory” endorsement. As a general contractor this is important, particularly since you are going to require the subcontractor to (i) indemnify you for claims relating to personal injury, property damage, or death, and (ii) identify you as an additional insured under its commercial general liability (CGL) policy for claims arising out of the subcontractor’s scope of work. The “primary and noncontributory” language in your subcontracts allows you to maximize the value of your additional insured status. A recent opinion explains why I reinforced the importance of this language. Any coverage provided in this endorsement is excess over any other valid and collectible insurance available to the additional insured whether primary, excess, contingent, or on any other basis unless the written contract, agreement, or certificate of insurance requires that this insurance be primary, in which case this insurance will be primary without contribution from such other insurance available to the additional insured. When the general contractor was sued it, as it should, tendered the defense of the lawsuit to the responsible subcontractors as an additional insured under their policies demanding both a defense and indemnification from the association’s claims. The insurer, however, refused to defend the general contractor. The general contractor’s insurer (Zurich) defended the general contractor in the action. 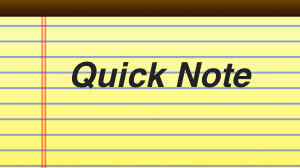 Thereafter, the general contractor’s CGL insurer sued the subcontractors’ CGL insurer. (The general contractor had also assigned its additional insured rights under the policies to its CGL insurer.) The general contractor’s CGL insurer was seeking reimbursement for the attorney’s fees and costs expended in the defense of the general contractor in the underlying construction defect lawsuit. The subcontractors’ CGL insurer moved to dismiss the claims based on the clause above—that the subcontractors’ CGL insurance operated as excess insurance over the general contractor’s CGL insurance. In other words, the subcontractors’ CGL insurance was not primary and noncontributory. There was no allegation that the subcontract included language requiring the subcontractor’s CGL insurer to be primary and noncontributory. The first reason this is an important point is because “when an insurance policy defines its coverage as secondary or “excess” to a primary policy, the excess insurer has no duty to defend the insured—so long as the primary policy provides for a defense and its coverage has not been exhausted.” Zurich American Ins. Co., supra, at *4. If the subcontractors’ CGL policy is excess, then than their CGL insurer does not have a duty to defend if the primary policy is not exhausted. This means they have no duty to defend the additional insured – not very helpful to a general contractor tendering the defense of the claim to responsible subcontractors. Zurich American Ins., Co., supra, at *5 (internal citations omitted). Since the general contractor’s CGL insurer bore the costs of the general contractor’s defense in the construction defect lawsuit, it cannot now divvy up the defense fees and costs to other insurers that may have had a similar obligation unless an exception to this rule applies (see below). 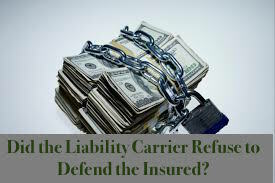 A “responsive” insurer who complied with its insured’s tender for defense can extract reimbursement from the “nonresponsive” insurer when the insured had separately contracted with another entity, itself an insured of the nonresponsive carrier, to indemnify the first insured. The logic of the exception is that the insured parties’ express decision to “shift[ ] exposure” from one to the other is imputed to the insurer relationship and overcomes the general anti-contribution principle. Zurich American Ins., Co., supra, at *8 (internal citations omitted). Since insurance, particularly liability insurance, is such an important component when it comes a construction project, understanding certain nuances such as a Coblentz Agreement (a what kind of agreement agreement?! ?—keep reading) becomes helpful. If there is a construction defect claim / lawsuit, the implicated parties (e.g., contractor, design professional, subcontractor, sub-consultants) are going to tender the claim / lawsuit to their respective liability insurer. This is what they should be doing – notifying the insurer so that the insurer can defend them from the claim / lawsuit and indemnify them from covered damages associated with the claim / lawsuit. And, if a contractor is an additional insured under an implicated subcontractor’s liability policy, it is going to demand that the insurer defend it (or share in the defense costs with other implicated subcontractors) and indemnify it based on the negligence of the primary insured-subcontractor. This is all par for the course in a construction defect lawsuit–really, any construction defect lawsuit. “In order to enforce a consent judgment entered pursuant to a Coblentz agreement, the assignee [claimant] must bring an action against the insurer and prove: (1) insurance coverage, (2) the insurance company wrongfully refused to defend its insured, and (3) the settlement was reasonable and made in good faith.” In Re: The Estate of Jorge Luis Arroyo, Jr. supra. “[W]hen an insurer refuses to defend its insured from a lawsuit, and the insured later settles the suit by entering into a Coblentz agreement, the insurer is precluded from relitigating the issue of its insured’s liability in subsequent proceedings.” In Re: The Estate of Jorge Luis Arroyo, Jr. supra. Stated differently, the insurer is precluded from later raising defenses on behalf of its insured that it could have previously raised had it simply defended its insured. In this case, the insurer ultimately tried to intervene in an underlying lawsuit once it was sued per the Coblentz agreement. Although the trial court permitted this intervention, the appellate court reversed because the insurer couldn’t relitigate issues it could have raised had it not declined to defend its insured– it was this declination that gave rise to the Coblentz agreement in the first place. The consent judgment established the insured’s liability to the claimant; thus, the issues to determine were (1) was there coverage, (2) did the insurer wrongfully refuse to defend the insured; and (3) was the settlement reasonable. As this case shows, sometimes a claimant needs to consider entering into a Coblentz Agreement to pursue recourse against an insurance policy. As a general contractor, you understand the importance of being named an additional insured under your subcontractors’ commercial general liability (CGL) policies. Not only do you want your subcontract to express that a subcontractor’s CGL policy is primary and noncontributory to your policy, but you want it to express that the subcontractor must identify you as an additional insured for ongoing and completed operations. Even with this language, you want the subcontractor to provide you with their additional insured endorsement and, preferably, a primary and noncontributory endorsement. These additional insured obligations are important to any general contractor that has been sued in a construction defect / property damage lawsuit. In the recent decision in Core Construction Services Southeast, Inc. v. Crum & Forster Ins. Co., 2016 WL 5403578 (11th Cir. 2016), a general contractor built a residential development. The general contractor required its roofing subcontractor to identify it as an additional insured under the roofer’s CGL policy. The general contractor was sued with the lawsuit asserting that the roofs were installed incorrectly. The general contractor tendered the defense of the claim to the roofer’s CGL insurer and the insurer refused to provide the defense because there was no “property damage” within the definition of the CGL policy (“physical injury to tangible property…”). The general contractor then filed a lawsuit against the subcontractor’s insurer arguing that the insurer was obligated to defend and indemnify it since the general contractor was an additional insured under the subcontractor’s CGL policy. The trial court, and as affirmed by the Eleventh Circuit Court of Appeal, held that the insurer owed no duty to defend or indemnity the general contractor because there was NO asserted property damage within the meaning of the policy. If there was no property damage then there was no obligation for the roofing subcontractor’s insurer to defend the general contractor as an additional insured under the subcontractor’s CGL policy. The underlying lawsuit only claimed that the roofs had been damaged but did NOT claim that the defective roofs had caused damage to other property (other components of the building). 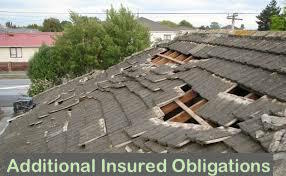 The omission of this assertion was important because the complaint was not pled to trigger insurance duties, such as additional insured obligations, since the cost to repair or replace the damaged roof would not be covered by the subcontractor’s CGL insurer. Rather, costs to replace or repair damage caused by the subcontractor’s defective roofing installation would be covered; however, such damage was not pled in the underlying complaint. Remember, the insurer’s duty to defend is only triggered based on allegations in the underlying complaint so without such allegations, there is no duty. QUICK NOTE: HAVE YOU SEEN THE “SEPARATION OF INSUREDS” PROVISION IN YOUR CGL POLICY? Have you ever looked at your CGL policy and seen the “Separation of Insureds” provision? You must have seen it but perhaps it does not ring a bell. If you are an additional insured under another’s policy or have additional insured under your policy, this is an important provision. Check out this article to understand the application of the “Separation of Insureds” provision in your CGL policy.